In the dramatic end to the Myreque series, face the Vampyre invasion of the River Salve and meet one of Hallowvale's infamous rulers. 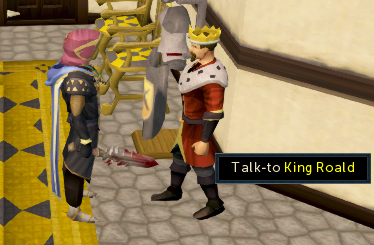 Speak to King Roald in Varrock Palace. To begin the quest, speak with King Roald in Varrock palace. Roald will tell you his force is in Paterdomus to fend off the incoming invasion and asks for your help. Accept the quest. Speak with Drezel and choose the talk about something else option. After you have done this, return to the surface and speak to Aeonsig, who is now slightly south of the temple. Three vampyres will fly in and attack. 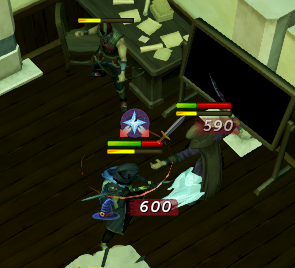 Kill them (a two handed melee weapon with AoE attacks is helpful here) and speak to Aesonig again. Aesonig will ask you to do three things: strengthen the Salve, clear the Paterdomus temple, and equip the Varrock forces with better gear. Return to Drezel and ask if he has any idea on how to strengthen the Salve. He says the answer may lie in a forbidden book titled the Sleeping Seven, which he hands to you. Skim through it and then speak to Drezel again, making sure you get told something by Ivan Strom. Now head down the trapdoor near Drezel and you will find yourself in the library. Search the westernmost bookcase on the northern wall to find this note. Now, search the northern bookcase on the western wall. Pull the book there and then do the same for the bookcase directly south of it. 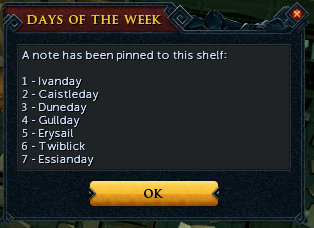 Next, search the middle bookcase with the book titled "The Ghost Town of Edgeville" and then the bookcase with the book "Falador Only a Model." Search the bookcase directly north of the prior bookcase to get the next step of the puzzle down. Search the easternmost bookcase and then the middle bookcase with the book "The Dark Jewel of Draynor" to complete the puzzle. Now take the book from the middle bookcase on the northern wall and return to Drezel. You'll tell Drezel that the only way to figure out a way to strength the Salve is to return to Ivandis' grave in Morytania. In case you've forgotten, Ivandis' grave can be found in the In Search of the Myrque path which is entered behind the Canifis bar. Enter the first cave entrance from Canifis pub and you'll find yourself in Ivandis' tomb. Pour the guthix balance potion you have on it and search the tomb for several items. Open the scroll case for several more items. Read the scroll of balance and then add the extra diary pages to the existing diary. Skim this new diary. Now it is time to make the super Guthix balance potion. Go to the Port Phasmatays and grind the silvthril bar with the bone hopper at the Ectofunctus to get silvthril dust. Next, head to the Nature Spirit grove and use the silvthril dust on the altar of nature to get blessed silvthril dust. For the Blisterwood dust, use your Drakan's Medallion to teleport to Darkmeyer. Chop a log from the Blisterwood tree and light these logs. 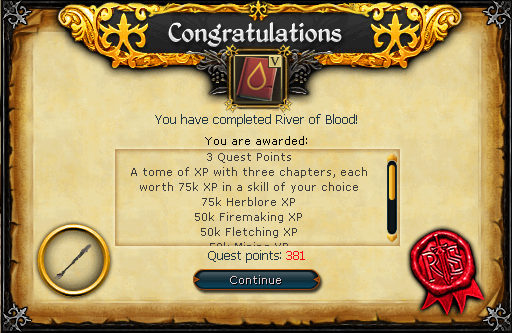 Pick up the Blisterwood ashes and add them to a super restore (3) to get the super Guthix balance restore potion. Speak to Drezel. He will suggest you pour the super Guthix balance restore potion into the well. Congratulations, you've strengthened the Salve. Now, you must retake the Temple of Paterdomus. There are plenty of monks in there, and for some reason Aesonig is expecting you to do it all by yourself. Fortunately the monks are only level 23, so it should be fairly easy. Once you've killed them all, head to the top floor. You should see two Zamorakians conversing. In a dramatic, and arguably stupid, fashion you enter the conversation. The two will begin to attack you. One will attack with magic and the other will attack with range. This fight is not terribly difficult but be on the lookout. The mage uses stuns, so have freedom at the ready. Kill the mage first, then the ranger. Now speak to Captain Rovin about armaments. If you have the needed materials, you can give them to him right after he asks you for them. Otherwise, bring the requested materials. The Blisterwood weapons require four (unblessed) silver sickles. Speak to Aesonig and tell him you have completed the three tasks. Aesonig will reply that Vanescula is standing outside Paterdomus on the Morytania side. Grab your combat gear (with blisterwood weapons) and speak to her. She will call her army, and Roald's will arrive in time. She will order her vampyre juvenates to cross the Salve, but they become feral thanks to your strengthening of the Salve. Kill these feral juvenates. Following this, a bigger, hairier vampyre will show up and kill Drezel. This vampyre, a "wyrd," will have three attacks. One is a simple drag you next to him attack. The second is an attack where he will summon a blood geyser under you. To avoid this, step a few squares off and proceed. His last and most powerful attack is a rush that will hit you 7500. When you see this attack, run several squares away. This can be difficult to do if you're meleeing, so be on your toes. Once you have defeated the wyrd, the wyrd will attack Ivan. As he is about to do this, the Icyene Efaritay will appear and send him off. Vanescula and the vampyres will fall back. Speak to Efaritay, who will talk about the vampyre you just fought. Teleport to Burgh de Rott and board the southern boat to the Icyene graveyard. She will speak of a pendant that you found in The Lord of Vampyrium. Inspect the statue of Queen Efaritay and you will find the pendant. Return it to her and she will tell you that she requires you to reforge the sunspear from the blade you obtained in The Lord of Vampyrium. Get some blisterwood logs and craft them into a blisterwood shaft. Now, with your wolfbane in your inventory, use the sunspear blade with the shaft to get the reconstructed sunspear. Return to Efaritay with the sunspear. She will tell you to keep it. 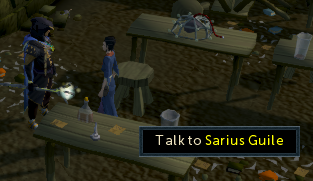 Now teleport to the Meiyerditch Laboratories and speak to Sarius Guile. Sarius will tell you that there are likely important hidden documents in the tunnels that have not been searched thoroughly. 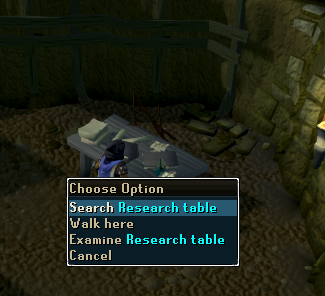 Head down the tunnel to the western room with the mutated bloodvelds and search the research table to find a book. Read it then return it to Sarius. This section will involve (safe) combat. The combat is not as difficult as the boss fight in The Lord of Vampyrium, but it could potentially trip you up. A familiar can also be brought. If you die and need to return, you can reenter through the front doors of Castle Drakan. Now you will need to return to the daeyalt mines (and bring a vampyre disguise with you). There are two ways to get there. The simplest way to get there is to take off your vampyre disguise and wander around Meiyerditch until a vyrewatch spots you and sends you to the mines. This unfortunately can take a bit of time if you are unlucky. The second is to teleport to Darkmeyer, exit it and enter Meiyerditch. This is the suggested method. The daeyalt mines should be right where you exit Meiyerditch. Emila: Let the anger flow through you. Sorin: Isn't this technology awesome? Ileana: I don't approve of this, and neither should you. Razvan: You should feel ashamed. Have you no remorse? Florin: Cheer up. Don't give up hope. And you should choose "I accept my fate and put my hand into the machine." Once you have tithed, extract the refined daeyalt from the center of the room. 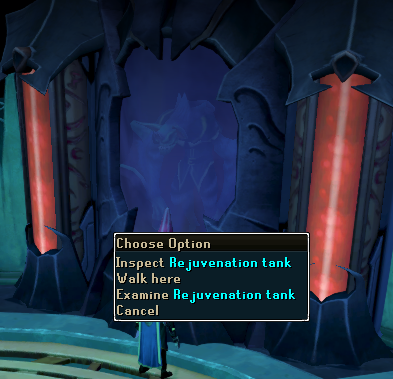 Now inspect the rejuvenation tank. Safalaan will jump out and swipe you with his poison, leaving you delirious. Head up the stairs and speak to Safalaan. He will disappear, leaving you in a room with skeletal hellhounds. Kill the skeletal hellhounds and then climb up the stairs. Now speak to the Myreque heads on the shelf. Vertida will ask where his holy water is. Head into the room to the east and pick up Vertida's holy water and continue along the pathway until you reach Harold. Throw the water at Harold and continue upstairs. Now you will find yourself with hallucinations of the Blisterwood Tree, the Stone of Jas, and a keg of gunpowder. Chop some Blisterwood logs and light the fire pit in front of the Stone of Jas. Now roll the keg of gunpowder to create an explosion that will blow a whole through the wall. Make your way through the debris to the next room. Climb the stairs and you'll find yourself on the roof of Castle Drakan. Speak to Safalaan. Efaritay will appear and Safalaan will attack her. Keeping Efaritay's health bar above 0 is not important - focus on Safalaan. Safalaan will have the same attacks he had in the past. After some time, you will hallucinate and you will be fighting Vanstron Klause. Vanstrom has a blood pool attack, similar to Safalaan, which can be avoided from running a few squares away from it. Other than that, it should not be terribly difficult. Once you have killed Vanstrom, you'll be back to fighting Safalaan. After depleting Safalaan's health a bit more, you will be fighting Lord Drakan! Lord Drakan is a bit more difficult than Vanstrom, with special blood bomb attacks (which you can avoid by running away from before they explode). After killing this hallucination, finish off Safalaan. Now defeated, Safalaan will give you some of his blood. Use the blood on the refined daeyalt with Ivan's serum in your inventory and you will get an extreme Guthix Balance. Speak to Efaritay to finish this segment of the quest. Now, return to Paterdomus and speak to Ivan Strom. He will tell you to pour the extreme Guthix Balance into the well, which you should do for a cool explosion. Now head outside and speak to Vanescula on the bridge of the River Salve. Vanescula will have another confrontation with you and attempt to send her army across the Salve with a similar result to the prior attempt. Safalaan will appear and morph into his old Iceyene form and talk Vanescula out of further confrontation. The new sunspear is a weapon that degrades but is augmentable. It can be changed into a magic and ranged counterpart as well as its natural melee state. If you lose it it can be reclaimed from Ivan Strom for 600,000 GP. Enter Castle Drakan and head to the throne room. Speak to Vanescula to get another Haemalchemy book. This will allow you to combine several potions with congealed blood, a drop from medium to high level Morytania monsters, to enhance potions. After this speak to Vanescula who will give to you a blood essence of your choice. What does the blood essence do? 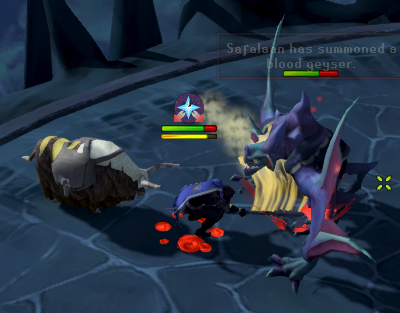 The blood essence acts as a bit of a boost in combat. Each blood essence has a different effect. Blood: Heals you in combat. When activated, you will be healed 25% of what your damage hit was. Aegis: Reduces damage that you receive. Reflecting: Reflects damage back at your opponent. Beserker: Gives you briefly (20 seconds) of an overload effect. Tireless: Slightly more adrenaline is gained during combat.